Your coffee shop "office" got you down? Marcia from 7X7 wrote about us again recently, by recommending The Lunchpad as one of the best spots in San Francisco for lunch meetings. Posted on July 14, 2013 by Mr Pickleton. Well the word is certainly out about our pop up and the great meals we're providing. hidden gem blog Daily Secret recently named The Lunchpad secret #379. Some more media love for our deliciousness! This time Marcia Gagliardi writes recommending The Lunchpad as a top San Francisco pop up everyone needs to try. We agree! 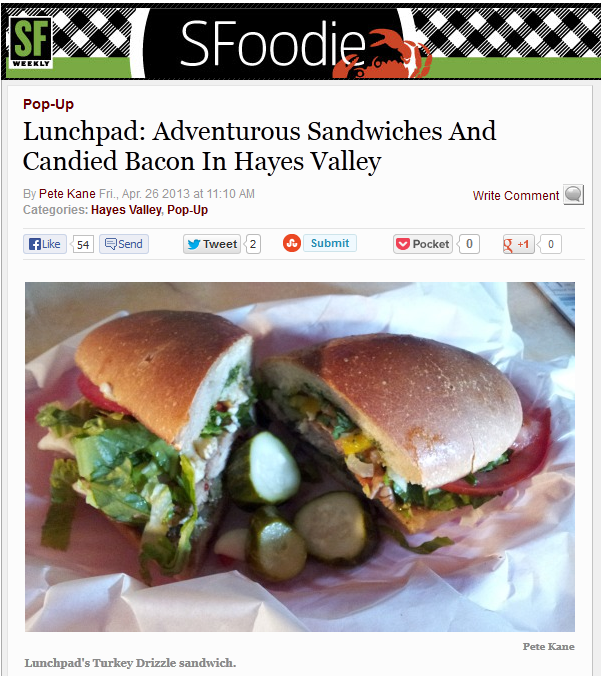 Local sandwich lover Pete Kane showing us some love, by bloggin about our great food. Check it out!